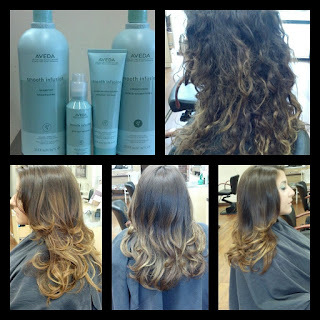 Cecilia, one of our awesome Aveda stylist from our Coconut Point location, created the look you see below with Aveda's Smooth Infusion line. The line was created for those who want straight, shiny hair. Aveda's Smooth Infusion line also protects the hair cuticle from heating elements; like blow dryers, flat irons or hot rollers. As you can see, it's humidity defense helped tame the model's frizzy curls and added shine. Southwest Florida weather this time of year has high humidity, which isn't always our hairs best friend. Stop in and try our Aveda Smooth Infusion line to experience 12 hours of humidity defense, thermal protection and shine. Want to schedule an appointment with our Aveda stylist Cecilia? Call our Coconut Point location 239-498-5004.